1 IN THE BEGINNING, there was chaos, sand and camels. And the United Nations said “LET THERE BE A PARTITION”. And lo, the Jews were to be separated from the Arabs and each would govern his own and peace would be created in the region. 2 But on the next day, Satan approached the Arabs and said unto them “Why settle for half when you can have all? I will show you how.” And Satan enjoined the Arabs living in the region to wait until the dark of night and then leave their homes and hide in the desert while the warriors of the surrounding Arab nations crushed the sons of Abraham. 3 It was to come to pass that the evil plan was destined to fail for the twelve tribes of Judea had been warned by an angel of the Lord and were prepared for the Arab invaders who were sorely beaten and even thrashed by the hand of God on the next day. 4 And when the dust of the conflagration had settled the Arab armies were smashed and the Arabs who had livedd in the region were forced to flee and condemned to wander the Earth in poverty and shame as their Arab brethren turned their backs on them and refused them succor. 5 From that day forward, the desert bloomed with gardens and the sons of Abraham were fruitful in the land God had promised them in the Covenant. 6 But after time the United Nations became known to the world as a useless, corrupt and ineffectual entity and the Arabs licked their wounds and plotted secretly to destroy that land which God had summoned His people to. The Assembly disregarded last minute Arab efforts to effect a compromise. Although the votes of a dozen or more delegations see-sawed to the last, supporters of partition had two votes more than the required two-thirds majority, or a margin of three. The roll-call vote was as follows: For (33) - Australia, Belgium, Bolivia, Brazil, Canada, Costa Rica, Czechoslovakia, Denmark, Dominican Republic, Ecuador, France, Guatemala, Haiti, Iceland, Liberia, Luxembourg, the Netherlands, New Zealand, Nicaragua, Norway, Panama, Paraguay, Peru Philippines, Poland, Sweden, Ukraine, South Africa, Uruguay, the Soviet Union, the United States, Venezuela, White Russia. Against (13) - Afghanistan, Cuba, Egypt, Greece, India, Iran, Iraq, Lebanon, Pakistan, Saudi Arabia, Syria, Turkey, Yemen. Abstentions (10) - Argentina, Chile, China, Colombia, El Salvador, Ethiopia, Honduras, Mexico, United Kingdom, Yugoslavia. All other questions before the Assembly were disposed of a week ago, and it ended its second regular session at 6:57 P.M. after farewell speeches by Dr. Oswaldo Aranha, its President, and Trygve Lie, the Secretary General. The Assembly’s third regular session is to open in a European capital on Sept. 21. The vote on partition was taken at 5:35 P. M. Representatives of Iraq, Saudi Arabia, Syria, and Yemen, four of the six Arab member states, announced that they would not be bound by the Assembly’s decision and walked determinedly out of the Assembly Hall at Flushing Meadow. The Egyptian and Lebanese delegates were silent but walked out, too. Sir Alexander Cadogan, representative of Britain, which is to terminate the League of Nations mandate over Palestine and withdraw all British troops by Aug. 1, made a brief statement after the vote. He requested the United Nations Palestine Commission to establish contact with the British Government about the date of its arrival in Palestine and the coordination of its plans with the withdrawal of British troops. The United Nations commission which will be responsible to the Security Council in the event that the Arabs carry out their threats to fight rather than agree to partition, will be composed of representatives of Bolivia, Czechoslovakia, Denmark, Panama and the Philippines. This state, which is understood to have the backing of the United States, was proposed by Dr. Aranha and approved without opposition after the Arab delegates had walked out. The commission, as proposed by the partition subcommittee, of the Assembly’s Ad Hoc Committee on Palestine, was to have been composed of Denmark, Guatemala, Iceland, Poland, and Uruguay, but the question was left to the Assembly because of United States opposition. The Assembly, without discussion, also approved an appropriation of $2,000,000 for the expenses of the commission, which will take over authority in Palestine after the British terminate the mandate and will then transfer it to the “shadow governments” of the two states. The walkout of the Arab delegates was taken as a clear indication that the Palestinian Arabs would have nothing to do with the Assembly’s decision. The British have emphasized repeatedly that British troops could not be used to impose a settlement not acceptable to both Jews and Arabs, and the partition plan does not provide outside military force to keep order. Instead, it provides for the establishment of armed militia by the two nascent states to keep internal order and that any threats to peace by the neighboring Arab states are to be referred to the Security Council. 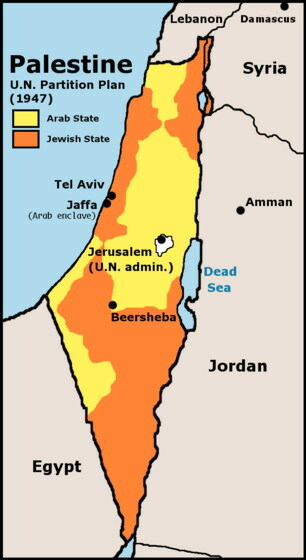 The Assembly decided Friday to take a recess of twenty-four hours to give the Arabs time to submit a comprise proposal, but this turned out to be what Mr. Johnson called a mere resurrection of the proposal for a federal Palestine, which had been recommended by a minority of the United Nations Special Committee on Palestine. The resolution to return the entire question to the Ad Hoc Committee on Palestine, introduced by Mostafa Adl, the representative of Iran, would furthermore have directed the committee to take into account the last-minute Arab proposal. A simple procedural resolution returning the question to the committee would have had precedence over the partition proposal, but Dr. Aranha, after considerable reflection, ruled that the extraneous provisions barred it from being treated as a procedural motion and that it could not be voted on until after the Assembly’s decision on partition. The United States delegation played its part in persuading the delegate in question not to present the motion for recommittal, and supporters of partition agreed that, after long hesitation, it had sincerely done its best to obtain Assembly approval of partition. It was still difficult to account for the fact that Greece, which otherwise followed United States leadership throughout the long Assembly, voted against partition and that some Latin American countries abstained. Britain, which brought the Palestine question before the Assembly last March, abstained on all votes in the Palestine committee and in poling on the issue in the Assembly. The Arab delegates, particularly after the vote, referred bitterly to the “heavy pressure” exerted on other delegations. Other delegates interpreted these complaints as attacks on the United States. This assertion drew hisses from the gallery, and Dr. Aranha pounded his gavel for order. (6) The Constitution will provide, among other things, for protection of the holy places, liberty of access to visit the holy places and freedom of religion as well as safeguarding of the rights of religious establishments of all nationalities in Palestine.